In all of the windows that Window Depot USA sells…the glass has at least TWO panes. Putting two panes of glasss inside of one window is referred to as ‘dual pane’, and is sometimes called ‘thermo-pane’. These two panes of glass provide an extra barrier to heat loss (or gain) during the heating and cooling months of the year. The two panes of glass, plus the airspace between…is what sets the stage for improved insulation. Then when Low E coatings and specialized gas fills like Argon are incorprated…we have what we call an Insulated Glass Unit. It is really the engine of the window. As amazing as dual pane windows are, there is a ‘next level’ energy saving technology, and that is Triple Pane. 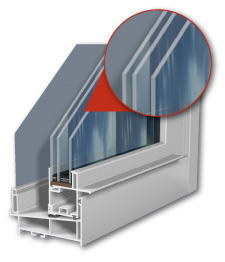 As you might expect…this simply means that a THIRD layer of glass is incorporated into the Insulated Glass Unit. But while this may sound simple, the effects are dramatic! Increased Insulating Power – Our Triple Pane windows can increase the U Factor of dual pane, clear glass windows by up to 52%. This improvement comes from a combination of the extra pane of glass, multiple cavities that contain insulating ‘blankets’ of Argon gas, and additional glass surfaces on which to apply our Low E coating technology. Enhanced Condensation Resistance – Condensation Resistance Factor (CRF) is a measurement used to highlight a windows ability to resist condensation from forming. Whenever condensation is present, the first thing to look for is the atmospheric conditions…or more simply put, is your home encouraging condensation. This can come from high humidity levels and/or lack of sufficient air-flow in the home…and is magnified by windows that do not provide good insulation. Highly insulating windows keep the temperature on the surface of the glass warmer, and thus more resistance to condensing the moisture rich air in the atmosphere of your home. There are many reasons to promote good condensation resistance. Excess moisture can lead to rotted window sills, and even mold and mildew promotion. Improved Sound Control – Another great feature of triple pane windows is their ability to block out more the NOISE form the outside world. Peace and quiet is often priceless! In most cities, Window Depot USA locations are now offering our exclusive “Energy Packages”, which save you even more. Two of these packages feature our incredible Triple Pane value. The GOLD Package – includes Low E coating and Argon Gas fill in both chambers created by the Triple Panes of glass. The PLATINUM Package – aside from our Argon Gas filling, this bundle includes Low E coating on TWO surfaces of glass for even more insulation factor. As you can tell…there is absolutely no comparison when it comes to the value you receive when improving your home with Triple Pane Windows. Triple Pane Windows are investments that increase the value of your home and enhance your lifestyle by adding years of comfort, security and energy efficiency.